Whereas many a Sundance film has aimed for timelessness at the festival, this year it's clear timeliness is key. 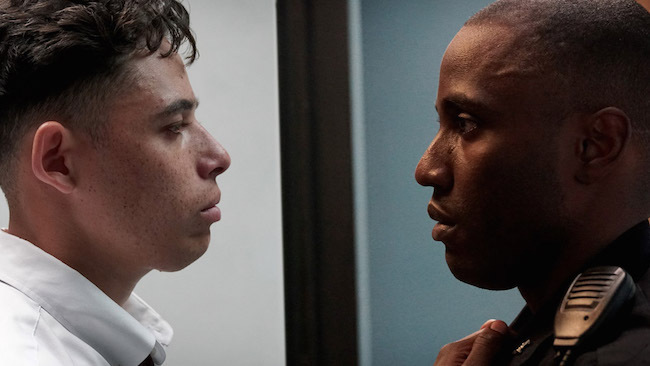 After day one's rousing premiere of Blindspotting which looks at the impact of an unarmed black man's death at the hands of cops, debut director Reinaldo Marcus Green's Monsters and Men offers a more textured, multi-faceted view. While it lacks the aforementioned film's passion and intensity, it is no less hard-hitting as a call for more understanding, and failing that, more activism. Set in Brooklyn's Bed-Stuy neighborhood, Green's film is inspired by the tragic death of Eric Garner, the unarmed New York man whose chokehold death at the hands of police gave birth to the "I Can't Breathe" movement. Interweaving three tales in the wake of a similar accident, the story follows Dennis, an African-American NYPD officer conflicted with the job in the wake of the killing. Frequently harassed when not in uniform, the film actually begins with him being pulled over for questionable reasons, Dennis is stuck between his sense of loyalty to the badge and the reality he sees on the street. The most effective, and sadly least complete, segment follows Manny (Anthony Ramos), who videotaped the killing and uploads it to Youtube, sparking city-wide riots. But his decision has dire repercussions just as his life is starting to turn around; a new job with which to take care of his wife (Jasmine Cephas Jones, basically playing the same role she had in Blindspotting) and daughter suddenly goes up in smoke when the cops arrest him on false charges as means of payback. Initially there's a disconnect with the third perspective, that of high school baseball phenom Zee (Kelvin Harrison Jr.), who has a life away from the racially-charged madness if he just keeps his head down. His father (Mudbound's Rob Morgan, great once again) certainly encourages his son to shut everything else out, but Zee can't ignore what's happening to the city around him and joins with a local activist (Chante Adams) to protest the man's death. An alum of Sundance's Screenwriters Lab and Sundance Institute Directors, Green drew from his own experiences growing up in New York, while also expanding on his 2015 short film Stop, which deals with racial profiling. He handles the difficult material like a seasoned pro; many first-time filmmakers would have felt the need to turn up the heat and send an obvious message. But there's nothing easy about any of the stories Green tells, and all come with surprising revelations. Dennis' story has the benefit of the charismatic John David Washington, channeling his father Denzel's constant swagger and commanding presence. A genuinely good cop, who breaks into impromptu pickup basketball games with the locals, he's nevertheless a staunch backer of police tactics when he's cornered in an argument. But even then, Washington convinces us of what is truly in Dennis' heart. "The job isn't a choice", he tells his wife (Nicole Beharie), who just wants her husband home safe and out of the growing conflict. But I was particularly struck by Anthony Ramos as Manny. Ramos, another native New Yorker just like Green, brings a realness that can't be faked. It's not hard to imagine that he's seen his share of racial injustice, in fact in the Q&A following the film's world premiere he spoke about what he's been through. And it comes through in his heartbreaking performance, as Manny gives a view that we've never seen on film before. We forget about the people who, sometimes at great risk, record police misconduct and make it public. Their stories deserve to be told, too. Green doesn't go out of his way to tell a complete narrative, which is frustrating, especially in the case of Manny. And despite Green's best efforts, the title of the movie gives away at least a little bit of bias. Dennis may be a good cop but what's he going to do about the bad cops that make him and others look bad? That question is never posed and it desperately needed to be. But then, Dennis' story isn't over. None of these stories are over, they will keep going on. There will always be racism, there will always be injustice, and there will be triumphs. Monsters and Men recognizes that these are just small moments in a greater tale yet to be written.